The mini gastric bypass (MGB) is a short and effective weight loss procedure that is gradually gaining in popularity. 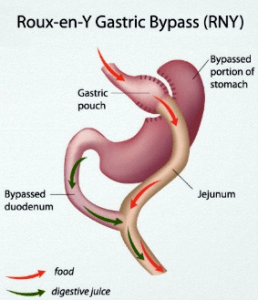 Prior to the development of the mini gastric bypass, Roux-en-Y gastric bypass surgery (RNY) was the laparoscopic bypass surgery of choice. But many surgeons and patients believe the MGB is a great alternative. It uses a long narrow tube that is typically connected to the esophagus, moving it to the small intestine. From beginning to end, the surgery takes an hour or less, with patients leaving the hospital the following day. It still ahs the same successful weight loss, but with less side effects, a faster recovery, and a less invasive procedure included. It also has fewer risks than the RNY and other gastric bypass surgery procedures, and is cheaper for patients. The mini gastric bypass procedure is a minimally invasive, laparoscopic procedure. There is a long narrow tube at the bottom of the esophagus, where it is partitioned from the stomach and connected to the small intestine. This procedure was first developed in 1997 by Dr. Robert Rutledge, though until recently, it has not been done nearly as often as the Roux-en-Y procedure. There is a loop of the smaller intestine that is brought up and hooked to this long tube, approximately 180 centimeters from the start of the intestine. This loop method is actually used for a variety of procedures of the stomach, including helping with ulcers, stomach trauma, and stomach cancer. All types of surgeries, including gastric bypass procedures like the mini gastric procedure, have a host of risks and complications. They do not occur in every patient, and in fact are quite rare, but should still be discussed. Before ever agreeing to a surgical procedure, you should speak to your doctor about all of the potential complications. There are mild to severe complications, ranging from anemia to hernias. Some of the possible risks and complications of the mini gastric bypass are abdominal hernia, abscess, anemia, bile reflux gastritis, dyspepsia, esophagitis, post-operative bleeding, gastrointestinal leak, incision hernia, pneumonia, malabsorption, marginal ulcers, stenosis, and wound sepsis. This is far fewer of risks than other forms of gastric bypass surgery, as it is a laparoscopic and minimally invasive procedure. The mini gastric bypass only lasts about an hour and most patients leave the hospital within a day. Some patients may need to stay up to 3-4 days, depending on their circumstances. Recovery from this type of bypass surgery is much easier and faster than other gastric bypass procedures. To improve the success of recovery, follow all of your surgeon’s post-surgery instructions, including taking medications and antibiotics, getting an adequate amount of rest, and wearing any compression stockings given to you to prevent blood clotting. There is not sufficient enough research aside from short-term results of mini gastric bypass procedures for proper information about living with the surgery over several years. However speculation shows that some things to be aware of include having diarrhea as a side effect, constipation by not drinking an adequate amount of water, and difficulty swallowing. On average, this type of gastric bypass procedure is around $7,000. Some hospitals may charge considerably more or less than this, depending on a number of factors. Because it is a simpler procedure, it is less than other types of gastric bypass procedures. Since it is considered an experimental surgery, insurance does not usually cover it. It is essential that you take your time in choosing a surgeon to perform the mini gastric weight loss procedure. It is in the early stages and still very much experimental, which means some surgeons may be performing it without adequate knowledge or experience. If you find a surgeon offering the mini gastric bypass, be sure to research the surgeon and find out exactly how many times they have performed it. Don’t just listen to other weight loss surgeries they have performed or even the Roux-en-Y procedures, but the mini gastric bypass procedure specifically. Ask for references of people who have had the procedure performed by this doctor. There are already successes of the mini gastric bypass procedure. If you are considering weight loss surgery but doesn’t want the longer recovery time and more risks of traditional methods, find a surgeon near you offering this less invasive option.